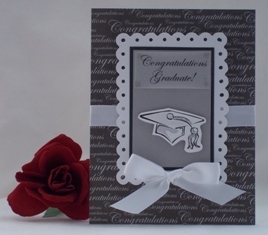 Make handmade graduation cards for family and friends. 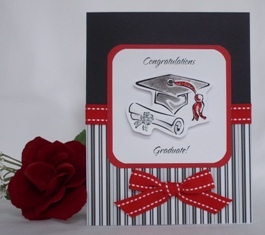 You'll find some graduation card that I've created that use a few amount of tools so you can start making your own graduation cards. 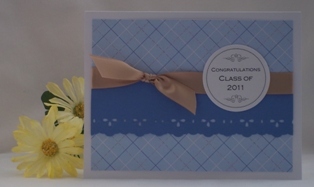 For this graduation card I used my 1" circle punch on all four corners of the sentiment to create the journal type label. 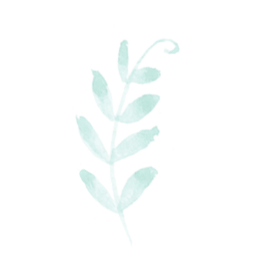 I accented the card with blue and green brads so they coordinate with the color scheme. 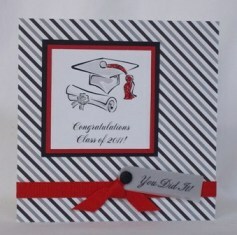 For your graduation card ideas, start off with a black and white color combination and then accent it with red. 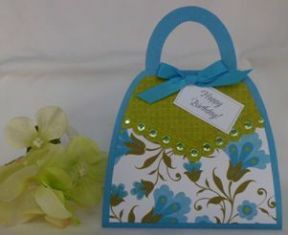 I used Fiskars' Round the Bend corner punch on this handmade card making project. I punched all four corners of the sentiment and the red border around the sentiment. The hat and diploma are images I created from free clipart. 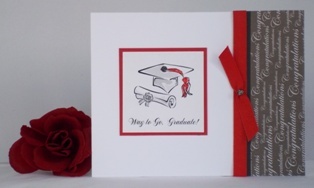 When making graduation cards, look to the web for free clip art. For this and my other homemade card ideas, I go to Microsoft's website for a variety of images. I used a diploma for this graduation card and added glitter to the ribbon. Start with scrapbook pattern paper for your homemade greeting card ideas. 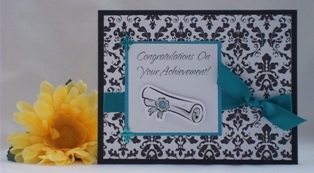 I used paper that had "Congratulations" on it for this graduation card design. The cap image was also downloaded from Microsoft's website and I added silver glitter on the tassel. The white scallop border was created using Fiskars Threading Water Border Punch. 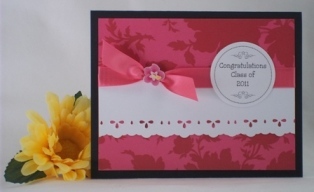 You can use these ideas for graduation cards but I've used the layout for other occasions as well. 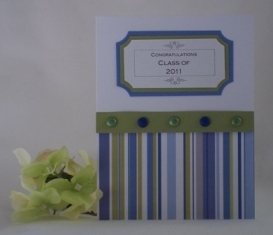 Homemade graduation card ideas can be simple if you are thinking of making one for a guy. I try to keep the bows at a minimum when thinking of making cards for men. I used browns and blues for this greeting card and punched out the sentiment using Fiskars' Extra Large Round-n-Round Squeeze Punch. I created the solid blue eyelet trim using Fiskars' Embossing Eyelet Lace Border Punch. 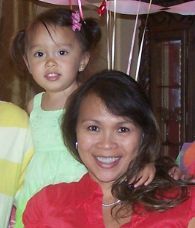 Here is the girl or female version of the card. I used pink, black and white colors instead of blue. You can change the colors to whatever you want or use school colors as well. I also added a small flower sticker over the knot instead of leaving it empty. 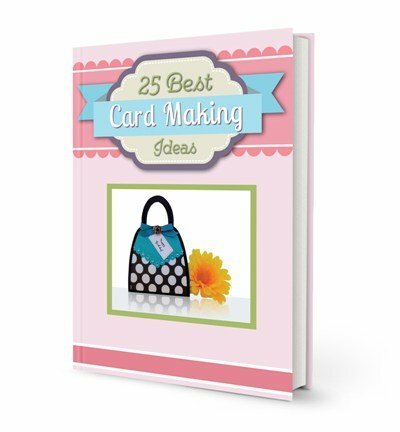 If you like my ideas, then check out my e-book 25 Best Card Making Ideas. Here's a card idea where you get the sentiments and pages of the banner tags which can be used for so many occassions like birthdays, Mother's Day or Easter. I've saved these ideas exclusively for card making enthusiasts and you won't find the ideas on my website, unless I was just too excited to share a couple of them.